Its strawberry flavor is fairly straightforward. Interestingly, Lion did not dye the paste pink or red. Instead, it's a clean white. Since I'm not a kid, I wouldn't enjoy the strawberry flavor every day. But it was mild enough that I didn't mind brushing with it. Toothpaste manufacturers don't want to make a toothpaste so appealing that kids would want to make an after-school treat out of the whole tube. So they have to make it nice enough that kids won't mind brushing but not tasty enough that they want to eat it. 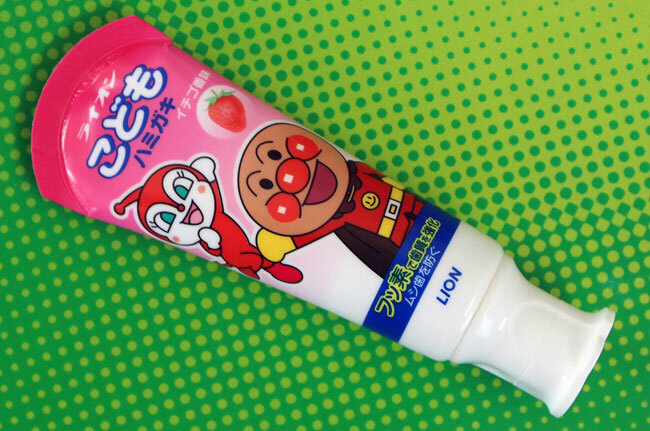 If you want to enjoy this uniquely Japanese experience, as of this writing, you can buy it on ebay... search for "LION Anpanman Japanese best seller-toothpaste for kids strawberry flavor 4packs".